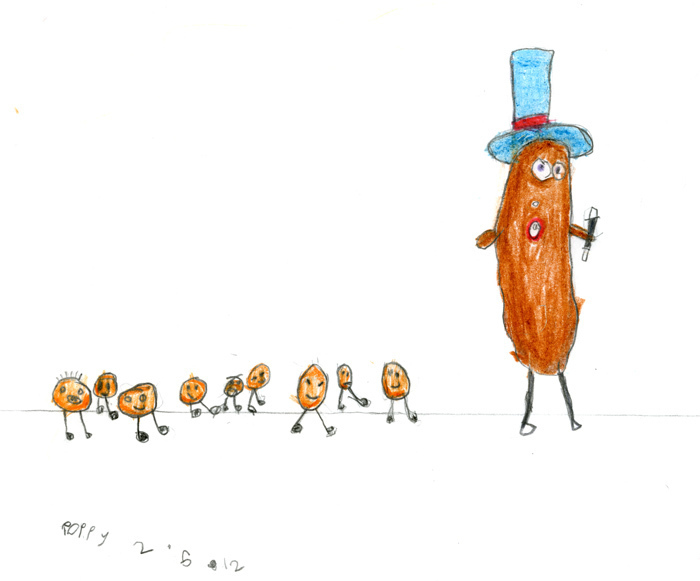 #44 A magician accidentally turns himself into a sausage and is chased by a pack of mischievous baked beans. I started to draw a sausage but decided that it really needed arms and legs, then I thought if a sausage could walk around it must be MAGIC, so it must be a magician that had aciddentally turned himself into a sausage!!!!. I tried to make him look surprised and drew him a magic wand so he could turn himself back before somebody decides to eat him!!!!. The beans were just funny and go very well with sausages.